Held at Georgetown University, The Carroll Round provides a unique forum for research and discussion among the world’s top undergraduates and encourages and supports scholarly innovation in the field. Hameem Raees Chowdhury and Virginia Minni presented at the 2015 Carroll Round, with Hameem presenting his paper 'Microcredit vs. Poverty: A comparative study of Joint-Liability Repayment Rates within Microcredit Communities', and Virginia’s paper, 'Can greater bank capital lead to less bank lending? An analysis of the bank-level evidence from Europe', looked at the interplay between bank lending and bank capital in Europe. 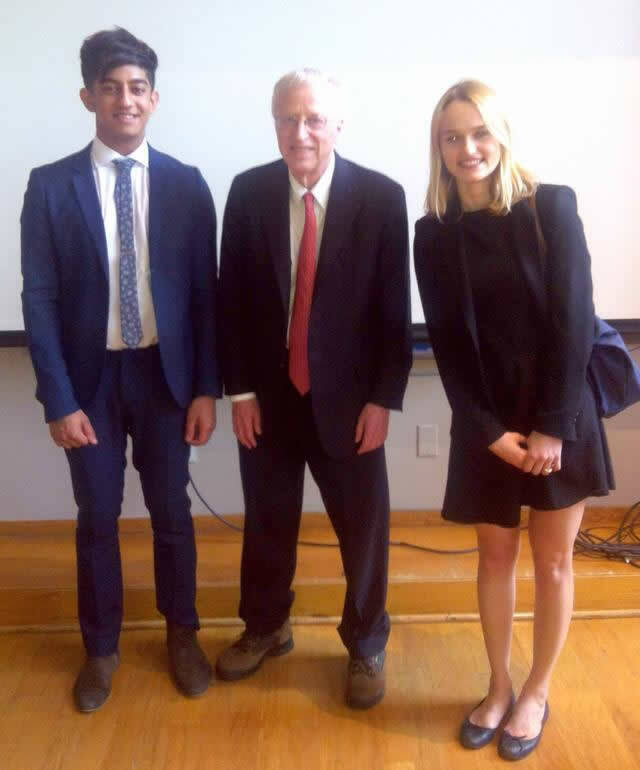 Hameem and Virginia with keynote speaker, Dr George Akerlof. I wholeheartedly advise those of you passionate about economics to seize the opportunity to apply to the Carroll Round. As well as the presentations by the participants, the event also included social gatherings and keynote speakers. The papers presented by our final-year students are products of our unique undergraduate ‘Research in Applied Economics’ (RAE) project, which has been commended by both external examiners and students themselves for the value it adds to job applications and preparation for postgraduate study.